"My body responded quite well to training and if we get good pacemakers like those we had last year coupled with favourable weather conditions, then nothing will stop us from smashing the world record." - Fortis Rotterdam Marathon competitor James Kwambai. Paula and Kara training together..
Cereal lovers: If you could only eat one cereal the rest of your life, what would it be? LRC Boards: Rotterdam Marathon Commentary The race will be shown at noon on TV and the web so we won't spoil the results for those who want to watch it. Tadesse Tola took his first marathon win with a 2:06:41 finish on the Champs Elysées. Atsede Bayisa repeated as women's champion in a Paris record 2:22:02 while Christelle Daunay finished 2nd in a French record 2:24:20. Rotterdam May Only Be Shown On Tape Delay? LetsRun.com Previews The 2010 Fortis Rotterdam Marathon Our top 9 picks from the men's field include the 3rd-fastest man in marathoning history, the 2009 Boston runner-up, the 2009 Berlin runner-up, the 2009 4th-place finisher in Fukuoka, the 2010 RAK Half Marathon champion, the 2010 City-Pier-City Half Marathon champion, the 2009 World Half Marathon silver medal winner, an undefeated young marathoner and a man who ran 5 marathons and 5 half marathons in 2009. *Look For Debut Marathon World Record To Go Down In Rotterdam Sunday Evans Rutto ran 2:05:50 in his first try at the marathon when he won Chicago. Can Bernard Kipyego or Jonathan Maiyo beat that mark? LRC F-M And Stotan Racing Coach Bill Aris To Join LetsRun.com For 8th Edition Of Training Talk Tune in Monday at 8pm for what promises to be a fascinating talk with the coach of Manlius XC girls, who have won 4 straight national XC titles. Recommended Read: Brief Chat With Ron Hill Hill has raced in 100 countries. Photos Of Grinnell College Runners Caught Outside In Vicious Hail Storm This might be a runner's worst non-fatal nightmare. Steve Holman Writes About Why He Is Only A Casual Track Fan Retired US mile great Steve Holman writes as part of the adidas Grand Prix Inside Track guest column series. Josh Cox Will Race For Comrades Marathon Win Big charity push trying to save lives of thousands of impoverished African kids. Nick Willis Says His Knee Injury Should Clear Soon Olympic medallist says Commonwealth Games are still in the picture. Mike Hurst Opinion On Popular Athletics Australia CEO Stepping Down Athletics Australia has had some nice medal hauls lately but apparently have only $55,000 in sponsorship money for track and field in 2010 and their coaches have been leaving for countries where they can get paid. adidas To Start Track Insider Column Series Steve Holman wrote the first of 6 pieces. Mo Trafeh Gets A Sponsor After 2 Big Races Trafeh has become a big name in American distance running after winning the US 15k championships in Jacksonville by a minute and then running 61:40 in the NYC Half. From NYRR Homepage: Central Park Reservoir Track To Be Dedicated To Alberto Arroyo The official public dedication of the track around the Central Park reservoir will take place on Monday, April 12, at 6:30 p.m. Alberto Arroyo will be honored at his familiar place at the pump house on the south end of the reservoir. Ben Johnson And Marion Jones Earn Spots In Time's Top 10 Disgraced Athletes Fans looking for more press for track and field always feel better when lists of scandals come out. More interesting to us was the fact that the Time editor considers Tiger Woods' transgressions to be worse than O.J. Simpson's. *Nike's New Tiger Commercial This commercial might be the most disturbingly profound thing we've seen in pop culture in years. Putin's Buddy Zhukov Picked To Replace Disgraced Russian Olympic Committee Head At least they're not "disappearing" the former Olympic Committee head. Revolution In Russian Olympic Committee These are the people who called 343 positive Russian tests in 3 years an "international conspiracy." Rio De Janeiro Hit With Massive Rains And Deadly Mudslides - 2016 Olympic Host Their annual rainy season has lasted 2 months longer than usual. Departing USOC Official Not Fired - Insider Insists It's All About Location While some have speculated it's about Chicago 2016's embarrassing exit, Alan Abrahamson sets the facts straight. 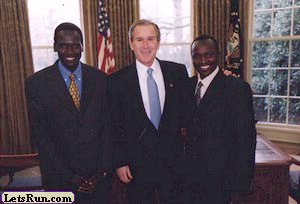 This week, we give props to Joseph Ebuya, pay homage to the man who invented running in Central Park, talk about how ridiculously stacked the SEC is, are inspired by the minds of two champions (Usain Bolt and Bernard Lagat), worry about Asbel Kiprop and talk about the women's 800 stars of 2008 (Pamela Jelimo) and 2009 (Caster Semenya). Lineth Chepkurui Looks To Follow Crescent City With Cherry Blossom 10 Miler Win Chepkurui flew to a 30:45 10k win last weekend. Tilahun Regassa is the biggest men's name along with 2 former champs. Russians Hire Former USOC Executive To Help Olympic Program Produce More Medals Huge move. Russians say they need to adopt American training methods. Paula Announces Baby #2 On The Way The world's fastest marathoner, Paula Radcliffe, and her 3:34 1,500m husband, Gary Lough, announced Paula is pregnant with baby #2. 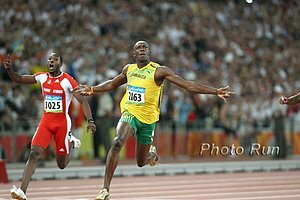 The plan is to take more time to recover from this pregnancy and be ready for London 2012. On The Boards: Goodbye 2012? Radcliffe is pregnant...again! We don't agree with the headline, since Paula all along planned to get pregnant this year. LRC Archives: Paula Talks About Training During Pregnancy #1 She trained twice a day through 7 months. Ndereba Out Of Boston - 2:07 Ukranian Dmytro Baranovsky Added To Men's Field 4-time champion Catherine Ndereba has picked up an injury. Dmytro Baranovsky is a big-time marathoner who may add to the race quality. David Monti Previews Fortis Rotterdam Marathon There might be 6 guys who go 2:05 or faster in this race. *Video Interview With 2:04 Man James Kwambai Kwambai has amazingly never won a big marathon despite running 2:04 and 2:05. Carlsbad 5k Men Preview - Eliud Kipchoge Will Run For 13:00 Road World Record Bolota Asmerom will go for the American road 5k record of 13:24. Meseret Defar makes a WR a possibility on the women's side. Paris Marathon Preview Expect a 2:06 from Paris but the big firepower will be in Rotterdam. Pyongyang Marathon Previewed Foreign athletes - be nice or your stay in North Korea might be longer and more arduous than any marathon could be! 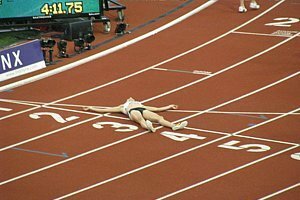 The Big Lead - Why Is Marion Jones Getting A Free Pass Without Admitting Guilt? Because she's going to the WNBA. Team USA Minnesota Signs 3-Year Contract Good news. London Marathon Furious With Channel 4's Investigation Into Charity Money London Marathon organizers express outrage over upcoming nationally-televised investigation calling it a "desperate attempt to undermine one of the world's finest sporting events." According to reports, London will pursue legal action. London Releases Statement Saying "We Have Nothing To Hide" Channel 4 was sued by London after a previous investigation, and forked over more than 1 million pounds in damages and fees. UK Athletics And London Marathon Announce Elite Training Funding Partnership The London Marathon will give over £200,000 to UK Athletics to support high altitude training bases in Kenya and France for British distance runners. Paula Radcliffe "Pulls Out Of London" The Guardian reports. The Virgin London site never announced Paula as a race entrant and the article has no quotes from Paula. 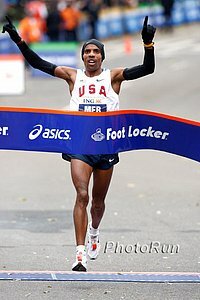 Defending champion Meb Keflezighi, 34, and Deena Kastor, 37, will be the core of New York's field 7 months from now. *Keflezighi To Defend New York Title First comes Boston in 11 days. *Deena To Run New York This Fall She'll have to deal with Liliya Shobukhova in London first. 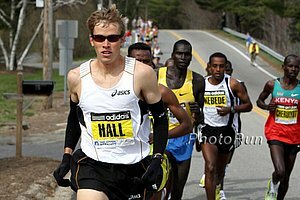 Ryan Hall and Bank of America Chicago Marathon race director Carey Pinkowski announced today that Hall will go for a fast time on 10.10.10 in Chicago this fall. *Boards: Hall to run Chicago The next question appears to be: Meb or Geb or both for New York? Caster Semenya - Winning In The Court Of Public Opinion? Semenya's Lawyers Say Tests Prove She Can Compete, IAAF Are Delaying Semenya's lawyers are going on the public relations offensive... perhaps their case isn't a slam dunk like they say? Angela Bizzarri Named AAU Sullivan Award Finalist 2 out of the 6 finalists are distance runners, proving that everyone should try to be like us. *LRC Training Talk 7: Joseph Ebuya's Coach And Manager Talk With LetsRun.com Hear the whole story as LetsRun.com co-founder Robert Johnson talks with manager/coach Ricky Simms along with special guest Noah Ngeny. *LRC Photos From World Cross-Country 2010 Photos of the Kenyans and Americans jumping the logs on the course in Poland. Judging from the texts, emails, posts, people upset with Obama, people wanting Obama to sue us for slander, a lot of viewers fell for our 2010 April Fools homepage. While our April Fools page was pretty good, the best April Fools Prank was on the Boston Marathon. A LetsRun.com visitor planned his prank weeks in advance as he created a fake a website mybaa.org (that looked nearly identical to the real Boston website) and said the Boston Marathon qualifying times changed 10 minutes for each age group. He then posted on LetsRun that the times changed and soon the news spread. People were up in arms and apparently the people at the Boston Marathon can't take a joke as they wasted who knows how much money having their lawyers send a letter threatening the guy. All we can say is - excellent job. voted the most popular shoes on LetsRun in 2009.